Make your own signs and letter your glass doors and windows with our pre-spaced vinyl lettering and graphics. A landlord of a strip mall or industrial park could save money and waiting time by having a janitor or other employee make the signage on site with local sign board material. If you insist on format signage only, you save even more and your park or mall will have a uniform, professional look. Order the vinyl lettering and graphics from us and do the rest in your shop. If you want to purchase 3M Reflective Scotchlite by the yard, click here. The three examples above are format signs. The arrow (top left) was applied by the city crew on site. The shop signs are identical except for the name of the business, which can be changed by the landlord. We can provide format signage for your business. There are hundreds of sign styles with an endless variety of symbols, colors and sizes. All we need is a fax showing what you want, and we'll make a scale drawing and fax it back to you usually within 4 hours. Many of our customers make signs with our lettering and graphics. 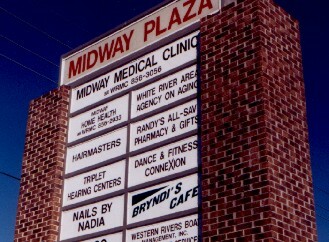 They provide the board or wall or existing sign, and we provide the lettering. Computer lettering is made of self-stick vinyl. Each letter is individually cut out. Entire sheets of pre-spaced lettering can be applied to any smooth surface in one piece. Lettering does not stick well to rough surfaces and water based paint. A smooth high quality Oil-based enamel is the best product to stick lettering to.